1 – Where did the number 325,000 barrels per day come from? Alberta estimates that there is about 35 million barrels in storage in December 2018 and that we are adding 190,000 barrels to that every day so they calculated that cutting 325,000 barrels per day would be about right. The bottom line, it is a solid educated guess. 2 – Does the curtailment only apply to oil sands? 3 – Will the 325,000 barrels per day cut continue throughout 2019? No, the Alberta Government will review the storage capacity issues every month and adjust and change the number of curtailed barrels? 4- How much oil will be ‘curtailed’ throughout the life of the program? 5 – How much oil will be ‘curtailed’ at the end of the program in December 2019? We don’t know at this point but the Alberta Governments press release says that by the end of the program in December 2019 they hope to be down to blocking 95,000 barrels of oil production per day. This calculates to about 285,000 barrels in December 2019. As you can see in the straight line calculation in the graphic about, it could be much closer to a million barrels. 6 – Is Saskatchewan also reducing oil production? 7 – Why is Saskatchewan not seeing the huge price differentials Alberta is? 8 – Who came up with this curtailment program? The Alberta Government formed a study group that considered options largely by consulting with large and small oil producers, to solve the glut. 9 – How was the “Alberta is losing $1B per year” number arrived at? The Alberta Government decided to follow the Scotiabank methodology to determine that the glut is costing about $80M/day and that calculates to $1.1B per year. 10 – Has the production cut worked so far? As usual, there is a combination of factors at play, most notably some refineries that were down for maintenance have come back online. 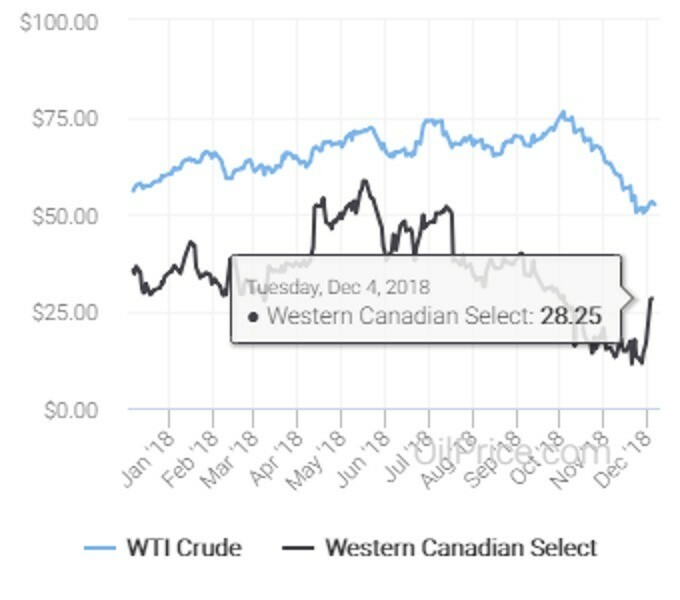 However there is no doubt that the serious production cuts have made a huge difference to the price of Western Canadian Select so far.